I’m done. Finished. Well, not quite, but…. Yesterday morning was my last ever lesson taught at this university. Or in China. I had lessons scheduled for yesterday afternoon and this morning, but those times were given over to final speaking tests. Now I have two writing tests on Monday and a pile of papers and recordings to grade and paperwork to be done and submitted. Then two New Years’ celebrations (one of the advantages of running two calendars at once… ), two months and five days and we’re on a plane out of here, making our way down to New Zealand to start a new life. This morning I saw this article in Yangzhou News, attributed (but not linked) to Beijing Business Today, reporting that 纽睿智 infant formula from New Zealand was on AQSIQ’s October list of substandard imported food and cosmetic products. Unfortunately there’s precious little information beyond that in the article, and searches of AQSIQ’s website aren’t turning up any more. But a little time on Google turns up this – 纽睿智’s website, with the English name ‘NuZealand’, and this, a tiny stub of an article that confirms NuZealand infant formula was on the October list of substandard products and gives two more details – it was 8197kg of product that failed inspection and was recalled, and it was made by New Zealand Dairy Products Limited, whose website seems to confirm, with a faintly-coloured link at the bottom of the front page, it produces NuZealand milk products. Also, on their products page, clicking on pictures of the NuZealand-branded products takes you either to the 纽睿智 page linked above, or to this page. New Zealand milk powder is good quality milk powder that has been consistently sought after by Chinese mothers, but, because Chinese demand is large, many bad companies have begun bringing some poor quality milk powder into the Chinese market, in search of large profits. Although New Zealand has good quality brands of milk powder, New Zealand milk powder is not necessarily all good. We hope that consumers can go through proper channels to buy better-known brands of milk powder to prevent poor quality brands from mixing into the Chinese market. Now there is a very important warning that all New Zealand businesses exporting, or wanting to export to China really need to take on board. It’s a warning that’s been out there for a few years now. If you’re exporting to China, especially if you’re exporting food and/or products aimed at Chinese children, you’d better make sure your quality and safety standards are beyond perfect. China’s tolerance for substandard imports came to an end some time ago. Posted in news, NZ and China | Comments Off on Substandard NuZealand? With Xi Jinping visiting New Zealand there is naturally an upspike in mentions of New Zealand in the Chinese press. Naturally, these mentions tend to be about Xi’s visit, but there are other things too. Things like this rather odd little article, attributed to Zhou Qiyuan of Nanjing Daily. “New Zealand has ‘three manys'”, the headline proclaims, “Many sheep, many birds, and many old people”. It then goes on to explain each of those ‘many’s one by one. It’s a pretty short article, so I’ll just translate the whole thing. New Zealand is a modernised agricultural country. The grasslands through all four seasons. Farm management is advanced, and only cattle and sheep can be seen, but no people. The whole country has a population of four or five million, but there are 20 million sheep. Exports of wool, sheep skin and sheep meat products occupy an important place in the economy. It has been called “a country riding on the sheep’s back”. There’s lots of interesting news about sheep in the media. Not long ago a sheep escaped from shearing and hid in a mountain cave, living in the wild 2 years before it was found by the farmer. In honour of its tenacious spirit searching for freedom, the farmer announced an amnesty for it: its wool would never be shorn again. New Zealand has many birds, and the birds like to fly out of the forest. They get along well with people because people like to share delicacies with them, rather than catch them. Wild pigeons, seagulls, sparrows, and other birds search for food in the centre of the capital Wellington. People sit on park benches resting and breaking bread and biscuits to feed the birds, a sight full of leisure and harmony. Everywhere in New Zealand you can see old people driving cars. But don’t worry, they’ve been driving since they were young, and are long comfortable with the car and familiar with the road. New Zealand has a saying: “An old man driving a car – stable and steady”. On New Zealand flights there are “air old ladies” – former air hostesses. New Zealand’s retirement system is relatively flexible, and one can choose between ‘on time’ or ‘over time’. On reaching retirement age, if you want to keep working and you are fit, you can continue to work, so in every industry you can see many old people. Many sheep. Yawn. The same old stereotype. At least they managed to update the numbers – when I was a kid it was “3 million people and 60 million sheep”, but economics has intervened since then – there’s much more money to be made in milk than wool, apparently. Still, ‘four or five million’ suggests Zhou hasn’t been overly diligent about getting accurate figures, and last I heard the saying was “built on the sheep’s back”, and applied equally to both NZ and Australia. Don’t forget, Australia’s most populous region is the southeast, the area inside the dog fence, which is traditionally sheep-farming country – for more, see “Waltzing Matilda”, and translate the lyrics into something approaching standard English. Many birds. On seeing that, I would’ve expected something about NZ’s native avifauna, which is pretty special in many ways. Remote islands do tend to have quite unique ecosystems. But no, pigeons, seagulls and sparrows. Of downtown Wellington. I grew up in Wellington, and I honestly can’t remember anybody expressing any fondness for those birds. Sure, people feed them. Sure, nobody tries to catch them – but why on Earth would you want to? I remember those birds as being seen more as flying rats and a nuisance than anything else. But then again, my wife has somehow got the impression that us Kiwis like our birds. That may say more about me than my compatriots, but she got that impression somehow. Oh, wait, we call ourselves Kiwis…. hmmm…. We have some pretty special native birds, like kiwi, kokako, kea, kereru, fantail, morepork, kaka, tui, pukeko, takahe, weka, whio, and so on, and so on…. But no, it’s people feeding flying rats in central Wellington that left a lasting impression on this reporter. Many old people. Oh dear. Every country has old people. China is also an ageing country with a lot of old people. I guess one obvious difference here is that widespread car ownership happened much, much earlier in NZ than in China, so the sight of old people who have been driving longer than most Chinese people have been alive is not so strange for a Kiwi, but perhaps a bit of a shock for this particular reporter. But that “New Zealand saying”? I’m going to go out on a limb here and accuse Zhou of interviewing her keyboard. After all, the second half, “四平八稳”, is a Chinese saying. But, sure, I can’t say I’ve heard of anybody being forced into retirement in NZ, although I have heard of that happening here in China. So, altogether rather strange. Perhaps Nanjing Daily should consider sending a better reporter next time – one with a bit more life experience and keener observation skills, perhaps? Posted in news, NZ and China | Comments Off on three manys? Today I see news that a company called Dakang Muye (大康牧业) is planning to spend 2.3 billion to buy two New Zealand farms. Exactly how big a sum 2.3 billion is depends, of course, on which currency we’re using. I think it safe to assume from context that the currency is Chinese Yuan/Renminbi. In which case, 2.3 billion would translate to NZ$ 457,613,434.77. Now, I have no idea how that link to XE.com will work, but that is the figure I was given. Also, I googled “大康牧业”, and among all the news articles was a site that looked like it might belong to the company, but AVG gave me a big, red, angry “Danger! Don’t go there!” warning, so I won’t link to it. My knowledge of finance and stock markets is extremely limited, so I may well make some mistakes here. If so, please do enlighten me. But the first paragraph seems to be saying that Dakang plans to raise 2.314 billion yuan through a private placement of 239 million shares priced at 9.69 yuan each, with the balance after fees have been paid to be used to purchase and remodel the Crafar Farms and Lochinver Station. But wait! Wasn’t it Shanghai Pengxin purchasing the Crafar Farms and Lochinver Station?! Paragraph 2 says that the company (Dakang) will use the money raised to buy 100% of An Yuan Dairy, An Yuan Dairy’s indirectly held title to the Crafar Farms, and the agreement to buy Lochinver Station signed by its subsidiary Pure 100. This will allow Dakang to indirectly take ownership of the Crafar Farms and purchase Lochinver Station. Paragraph 3 seems to be a clarifier, answering, “So who’s who and who owns who?” I’ll do my best to get this all straight. Paragraph 3 identifies An Yuan as the Hong Kong-listed wholly-owned subsidiary of Dakang’s controlling shareholder Shanghai Pengxin. So, Shanghai Pengxin is selling 100% of its wholly-owned subsidiary An Yuan Dairy to Dakang, a company in which it has a controlling stake. Which begs the question: Who owns the rest of Dakang? This paragraph also gives some basic information on the Crafar Farms and Lochinver Station. But the next paragraph is where it gets exciting, pointing out that the combined 22 thousand hectares of the Crafar Farms and Lochinver and the 4000 hectares managed on behalf of Synlait Farms would make Dakang the third largest holder and operator of farmland in New Zealand, with annual production of milk solids from these three farms [note: yes, Crafar is 16 farms, but the article treats them as one unit in this sentence] projected to reach 15 million kilograms. And the goal, the next paragraph explains, is to create a unified production chain, allowing Dakang to supply all the infant formula and liquid milk for its subsidiary Shanghai NuZealand itself. And yes, judging by this article from April last year, NuZealand is the ‘English name’ chosen for ‘纽仕兰 (Niǔshìlán)’. And judging by this article from 21 July this year, Dakang bought a 0.64% share in NuZealand from its controlling shareholder Shanghai Pengxin for 8 million yuan. And now I am running out of time, so I shall leave it at that for now. 1: The aesthetic seems to be largely the same among all such stores, from the general layout right down to the colour schemes, size, style, and fonts on the signage. 2: Although they are generally green grocers, the focus is definitely on fruit – to the point where the names of the stores, be they independent or branches of a chain, always feature the character 果 (guǒ, fruit). 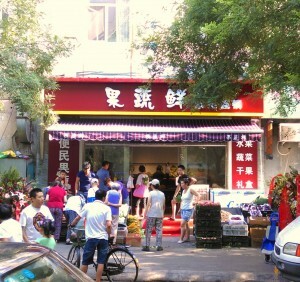 In this photo, the store’s name is 果蔬鲜 (Guǒ Shū Xiān), which, in addition to having quite a pleasant sound, means literally “Fruit Vegetable Fresh”. Another new grocer I’ve seen is called 多果多 (Duō Guǒ Duō) – “Lots of fruit, lots”. 3: This is perhaps the important bit: These stores seem to be occupying a previously vacant niche between supermarkets and markets. 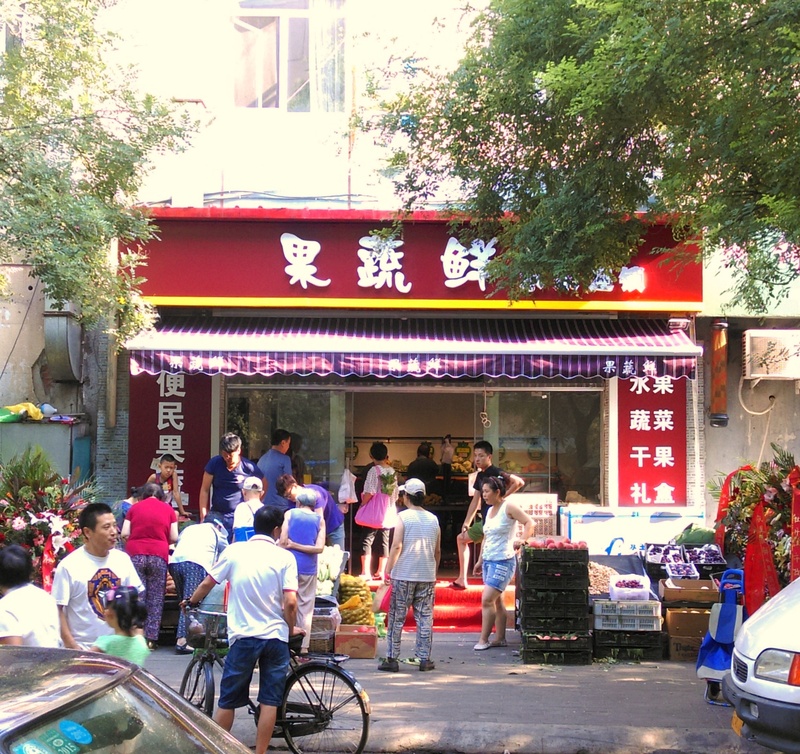 The example in the photo above is located in a residential area right around the corner from a lane that becomes an impromptu market in the mornings. Not far away is the large, 2-storey barn that the local outdoor market was moved in to a few years back. About 500 metres down the road is a supermarket. And so the locals have choices: They could buy their fruit and veges from people squatting behind blankets spread out on the ground; They could walk a little further and buy from a market which is certainly cleaner and has a full range of other daily goods and necessities, but is still very much small stallholders, with all the nagging little questions about where they’re really sourcing their products from; They could trek down to the supermarket and pay definitely higher prices while getting no greater a range of produce to choose from; Or now they can shop at this new green grocer, which has a good range of fruit and vegetables, and whose set-up and signage projects that same air of security and confidence as the supermarket. Now, Zespri is doing a very good job. Zespri is easy enough to find, especially in higher end/international supermarkets. Zespri is doing well enough that I’ve seen cartons of kiwifruit in suspiciously Zespri-like colours with suspiciously close to IPR-infringing labels. But I don’t see a lot of other New Zealand fruit around. It seems to me that New Zealand has two huge advantages when selling fruit to China, namely its clean, green, quality reputation and the off season. These new stores seem to me a good sign of the demand among ordinary Chinese for better quality goods and a better quality experience. Surely New Zealand could step up? Note: This is a very slightly altered version of a post I wrote on my Linked In profile. There’s a link to my Linked In profile on the right sidebar if you’re interested. The New Zealand Herald has been running a China Connection series by Paul Lewis in association with the BNZ every Friday, and as the series continues it gets more interesting. Today’s instalment looks at SMEs and China, and there are three points that grabbed my attention. There is a spelling mistake here, and it is not as minor as it seems. The problem is in the names of those three Chinese cities. Now, it is fair to not include tone diacriticals, as a strict adherence to the rules of Hànyǔ Pīnyīn would dictate, firstly because the article is in English and aimed at a general anglophone reader base, and secondly because very few Chinese people bother including tone diacriticals. Far more important, though, is the missing apostrophe. In Hànyǔ Pīnyīn, when the spelling of a word creates some confusion as to whether it is one syllable or two, or where the break between two syllables is not made clear by the spelling, an apostrophe is used to separate the two syllables. Xian is one single syllable, and therefore one Chinese character, perhaps 先 (first), 县 (county) or 线 (line). The name of the capital city of Shaanxi Province is Xi’an – the apostrophe makes clear that it is two syllables and where those two syllables break. In Chinese characters it is 西安 – you can see the difference between the city name and the monosyllabic possibilities above. This is not just a writing teacher being unnecessarily or excessively fussy about spelling, nor is it a Sinicised version of the rage some feel at the sight of the infamous ‘greengrocer’s apostrophe’. Attention to detail is important. David Cunliffe’s electorate office recently had a bit of bother digging up some old documentation because somebody had filed it under ‘Lui’ instead of the correctly-spelled ‘Liu’. I am aware of a recent case where somebody’s inattention to detail has caused quite a lot of strife for some new graduates, to the point where one has lost a job because her paperwork did not arrive in time, and other people’s jobs or enrolment in masters degree courses could be affected. Inattention to apparently minor detail can have some surprisingly big real world consequences. The first reason that grabbed my attention is the image of the two countries playing to their relative strengths. That is absolutely what needs to be done. Unfortunately, in my experience in education, it is something that all too often fails to happen. I have seen far too many rely on something vague like “the English language” or “quality education”, perhaps with “comparatively cheap” thrown in. This is the wrong approach because plenty of other bigger, better known countries have exactly the same thing to offer. New Zealand is a very small player in a very large world, and so New Zealand needs to be very specific and very loud about the precise advantages and strengths that New Zealand has to offer. This applies to the country as a whole and to every specific company, organisation and institution looking to break into the China market. The deal EIT is doing with Qilu University of Technology that I posted about on July 4 (I hope that link works – I’m still getting used to Linked In’s set-up) is a good example of how things should be done – EIT playing up the specific strengths it and its region have to offer to a university and a region that stand to benefit directly from those strengths. Asked whether the two countries had a different approach to doing business in China, Healy said: “I think New Zealanders have a natural advantage in working well with other cultures. You can see how that comes out of daily life here. “New Zealanders perhaps come across as more culturally aware whereas Australians maybe tend to be more strongly perceived as Australians. It means New Zealanders do well overseas, when dealing with locals from different cultures. My experience has been different. Yes, New Zealanders do generally get along. I think that’s the advantage of coming from a conformist, non-confrontational culture – from an early age you are taught to find ways to blend in and compromise. But, well, put it this way: Although Americans have the reputation for being bad, ungrateful and ungracious travellers, I have met Americans who speak standard Mandarin better than most Chinese. All the Americans I’ve met in China who do not speak Mandarin have been apologetic about that fact. I have heard two New Zealanders boast about having lived in China for years and not speaking a word of Mandarin beyond the bear necessities to travel between work, home and play and keep themselves fed and watered. I have seen New Zealand programmes in China fail in part because management was blissfully unaware of the linguistic, cultural and social aspects of what they were trying to do in China. Quite simply, New Zealand does not value foreign language or cross-cultural communication skills anywhere near enough, and too few New Zealanders appreciate the importance of the linguistic, social and cultural aspects of business. This ties into a theme that runs through Lewis’ article: Preparation. To succeed in China you must be well prepared. I have seen some arrive in China apparently thinking that Jim Morrison’s advice to Wayne in Wayne’s World 2 is all they need: “If you book them, they will come”. No. In addition to all the usual legal, financial and commercial considerations, you need to remember that you’re dealing with a very different culture and a very different society, and that everything is going to be translated into a very different language. It sounds obvious, and it is obvious, but I’ve seen too many forget this. For example, your posters full of pictures of young people climbing mountains, surfing, skiing and kayaking might be great for recruiting New Zealand students who are looking as much at lifestyle considerations as they are at study opportunities, but they will have Chinese parents saying no and moving on – and yes, I have seen this. But wait, “New Zealand students”, “Chinese parents”? Well, yes. If it’s education you’re selling you need to understand that there is a very different set of equations governing who makes the decisions and how. So how do you attract Chinese students? What is written about China in English represents only one tiny part of the picture. To keep up with how things are changing in China and how those changes are going to affect your business, whether it’s milk powder or IT or education, you need to get a fuller grasp of the overall picture. During Fonterra’s recent DCD and botulism scandals the New Zealand media passed on Fonterra’s and the MPI’s assurances that everything was fine. The Chinese media reported something rather different. You need to be able to listen to Chinese people and read what they write.